I’ve been doing searches for a second “Broken System, Broken Record” Quotes of the Day (look for it soon) and came across the text of Governor Doyle’s 2003 “State of the State” speech (his first). He doesn’t use the phrase “broken system,” but he does say some things worth rereading. 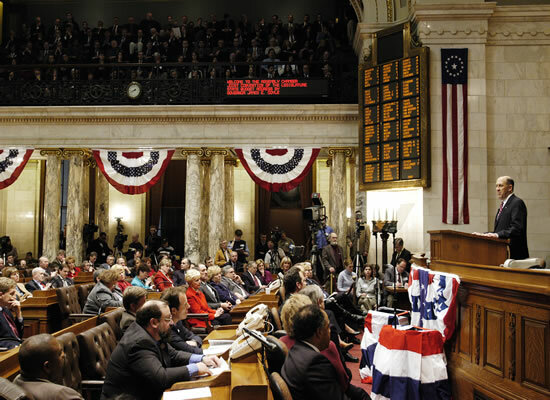 It is time to reform the way Wisconsin funds our children’s education. That is why tonight I am announcing that I will form a Governors Task Force on Education Financing. This is too important of an issue to squeeze it into a budget proposal or devise a new plan in just a few weeks. To do it right we need to do two things. First, all views must be represented. Parents, taxpayers, teachers, community leaders. Urban districts, rural districts. Wealthy areas, poorer areas. Second, the meetings must be open, in full view of the public. That Task Force was formed and produced some good work. Since June of 2004, that work has gathered dust. I’m often hard on Governor Doyle in relation to his support for education. I’ll acknowledge that he has been a friend to education in many ways and deserves credit and thanks for that. What he has not been (in my opinion) is the champion for education that we need. Doyle has done very well in protecting the schools from the worst of the potential cuts under a system that all but guarantees some cuts and some property tax increases; he’s tried to keep the state’s 2/3 funding commitment viable, he’s worked for increases in SAGE and Special Education funding and succeeded in making these programs slightly less underfunded. All this is good. What he hasn’t done (unless you count the recent trial balloon, which may be a good sign) is followed up his statement form 2003: “It is time to reform the way Wisconsin funds our children’s education.” That statement was true in 2003; after six years of annual cuts to educational opportunities of 1% to 2% it is even more true today. I hope that we will soon see Governor Doyle act on this truth and be the champion he could and should be.